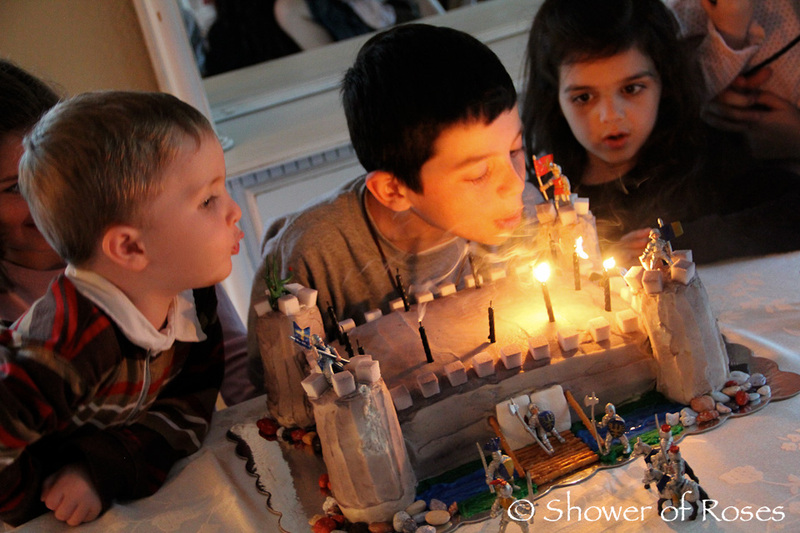 This year Captain choose a "Medieval Knights, Dragons and Castles" theme for his birthday celebration! I thought it was a perfect theme, especially since we had just finished studying the Middle Ages this past year for History. 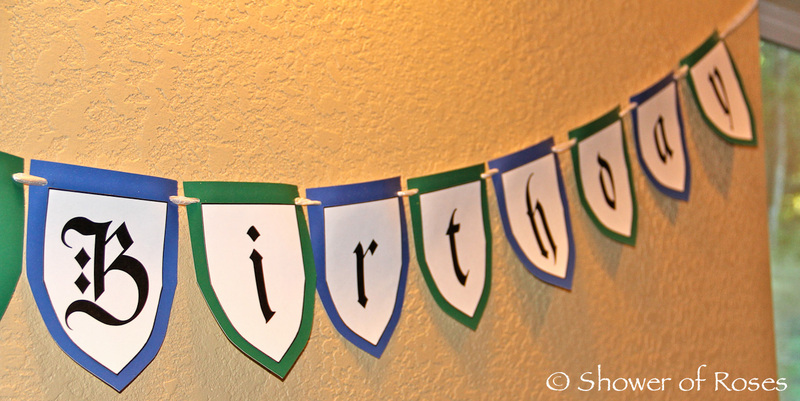 I enjoyed making birthday banners for our recent Lego and Nesting Doll birthday parties, so I thought I would try and make a Medieval Banner too! 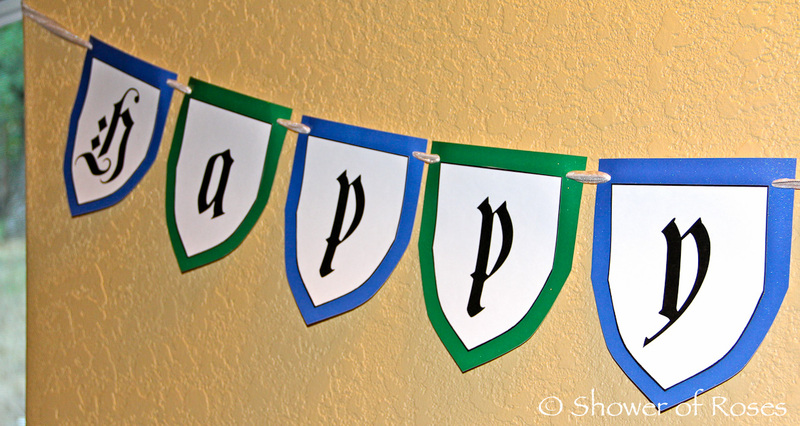 I downloaded a "Black Knight" font and created signs using the letters for "Happy Birthday" centered on an outline of a Knights Shield. (Here is a pdf copy of my document.) I then made a slightly larger Knight Shield to be used as a template for the background color. 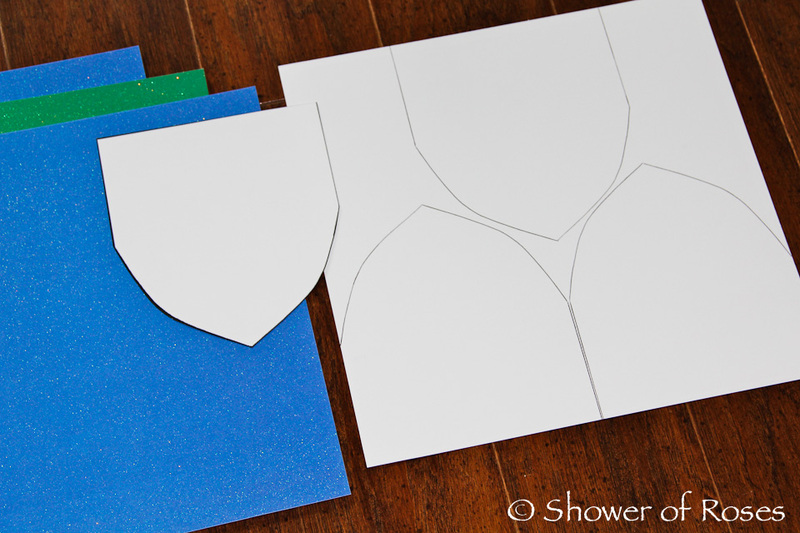 (template here) I was able to get three Shields out of each 12x12 piece of green or blue glitter card stock. I punched a small hole into each corner, running white/silver ribbon through each card. 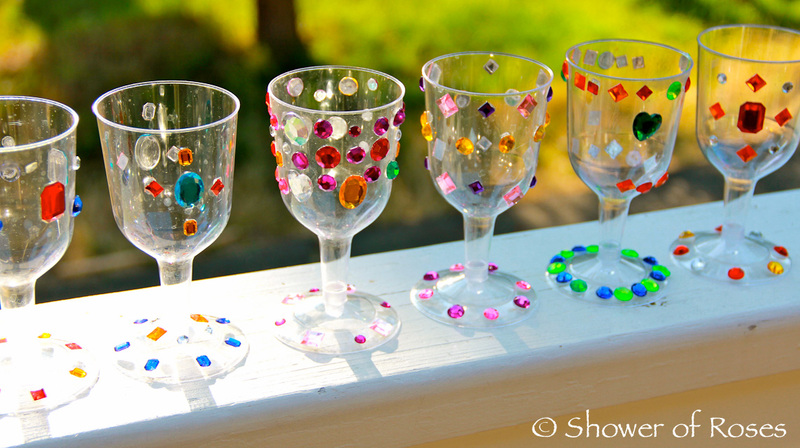 Originally I had wanted to order Goblets from Oriental Trading, but due to the cost I decided to try and make our own. 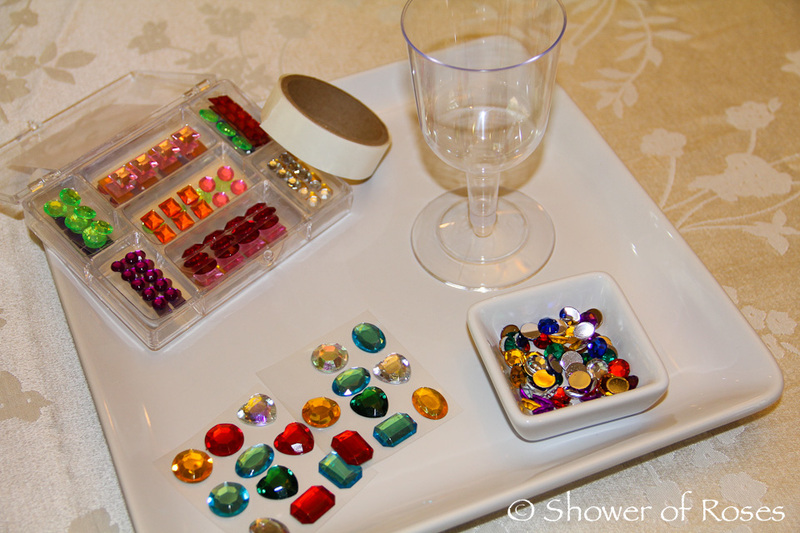 I found some plastic wine glasses at the dollar store, and purchased some acrylic gemstones. 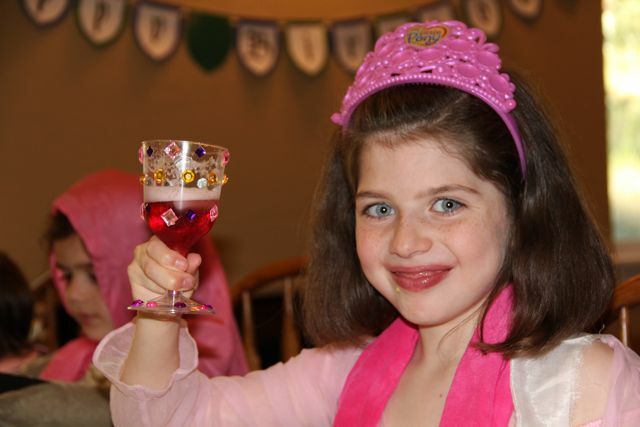 I decided to have each of the kids decorate their own Goblet during the party as a fun activity. They loved it! In the end I think they turned out cuter than the other option, and so much less expensive!
. : Medieval Feast Menu :. 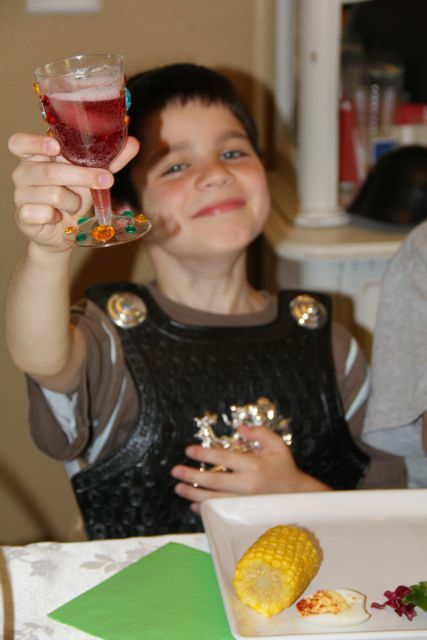 *not exactly medieval, but a favorite of the birthday boy! As you all know, I love candy molds! 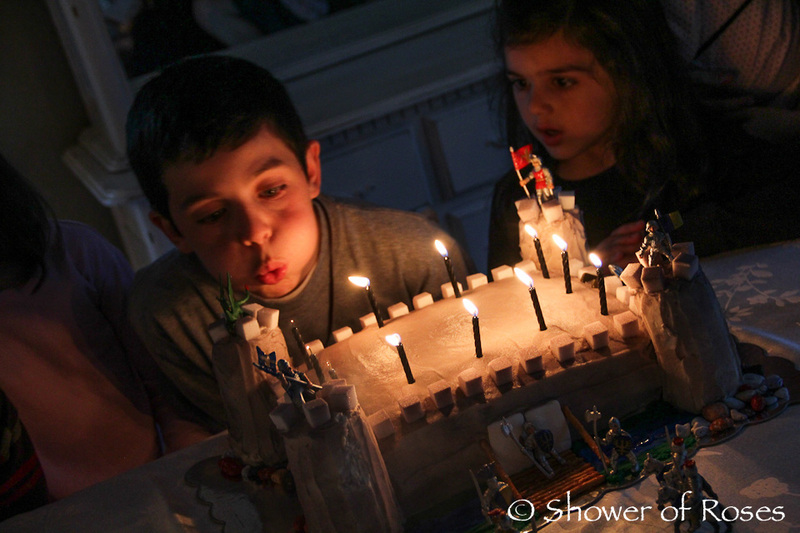 I purchased the Dragon and Castle molds for this party. 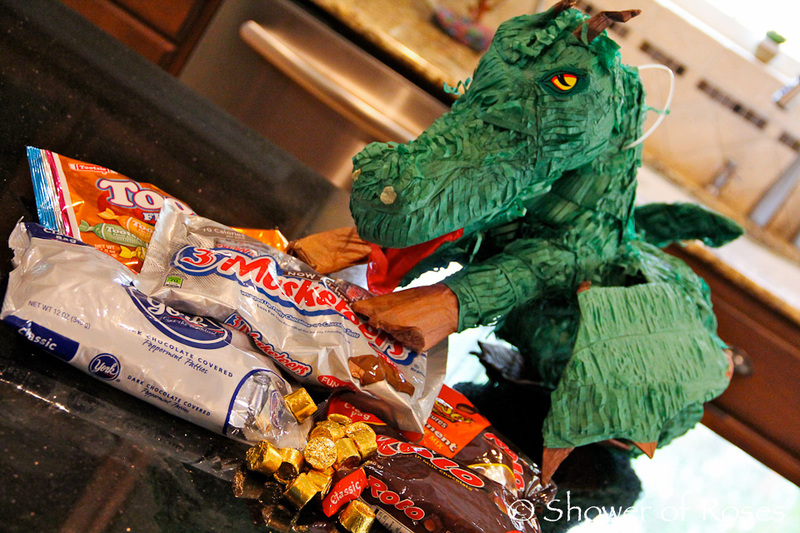 (They both required a lot of melted candy, and the smaller version of the castle would have probably been perfect.) Originally my plan was to create Red and Green Dragons, and Grey castles with Black doors. 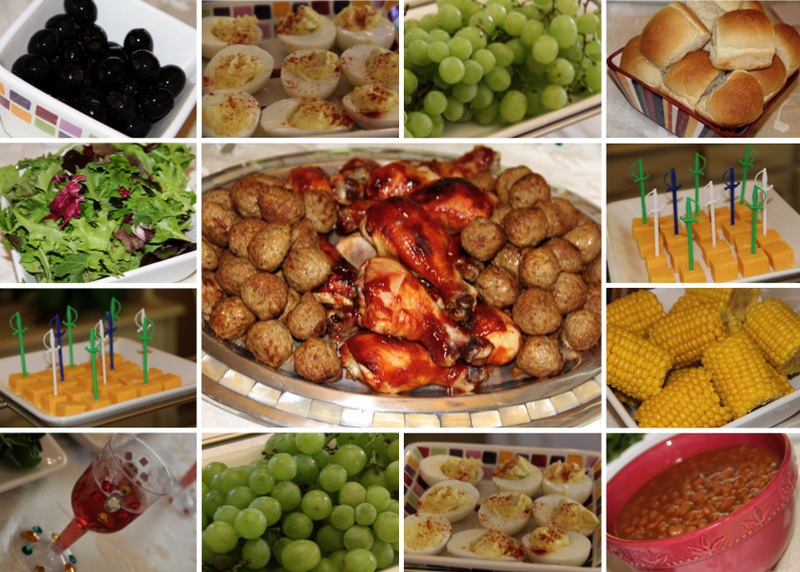 I ran out of time to prepare, so I ended up letting the kids each make their own! 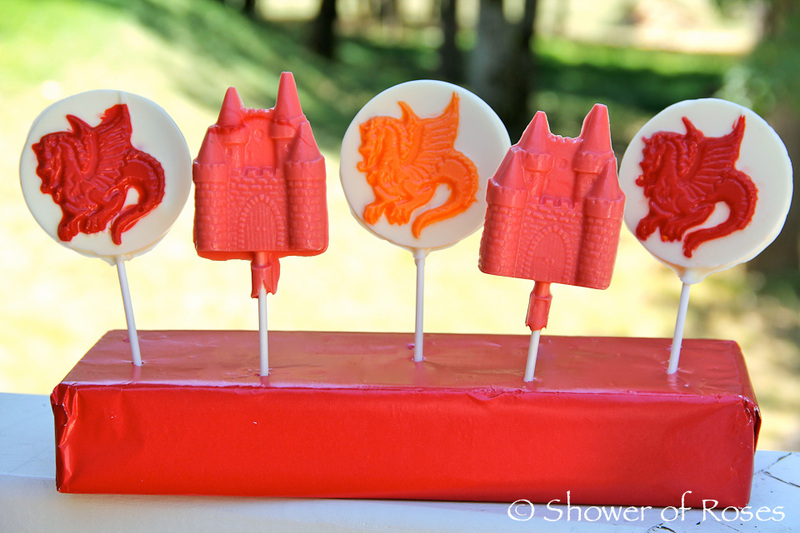 The boys choose red and orange dragons and the girls wanted to make pink castles, mixing the white and red chocolates together. They turned out cute, and total proof of how easy these are, if my kids were able to make them on their own! 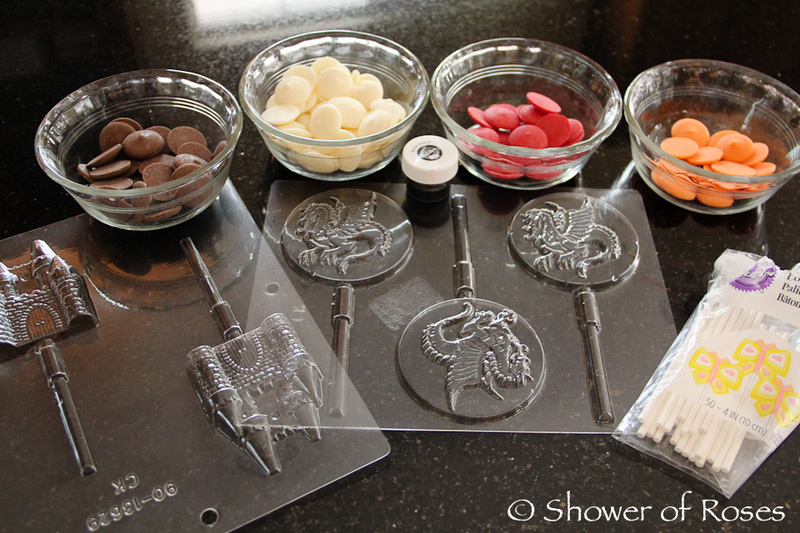 Other molds that would work great for this party theme are the Friendly Dragon Candy Molds, the Dragon And Dungeon Candy Mold, the Friendly Dragon Pop Candy Molds,the 2-Inch Castle Chocolate Mold and the Knight & Mount Chocolate Mold . 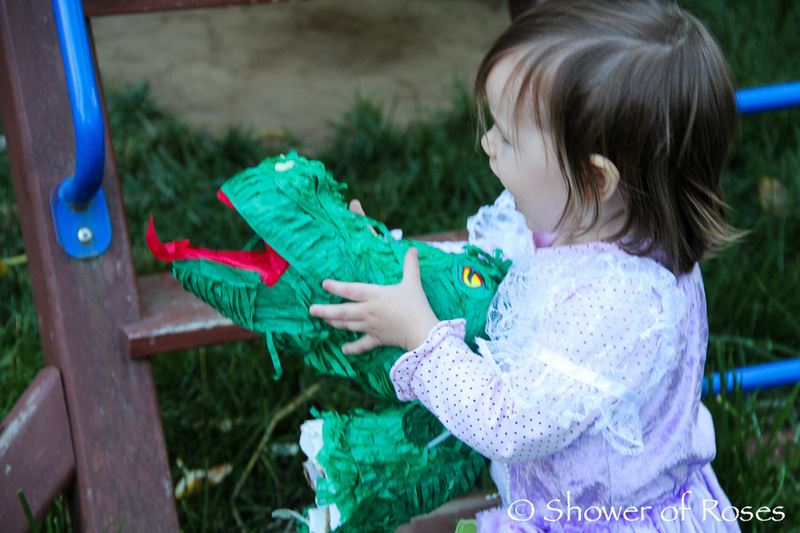 A couple days before the birthday, I stopped by a local party shop (for some plastic cocktail swords) and found this cute dragon pinata at an affordable price. I had to get him! 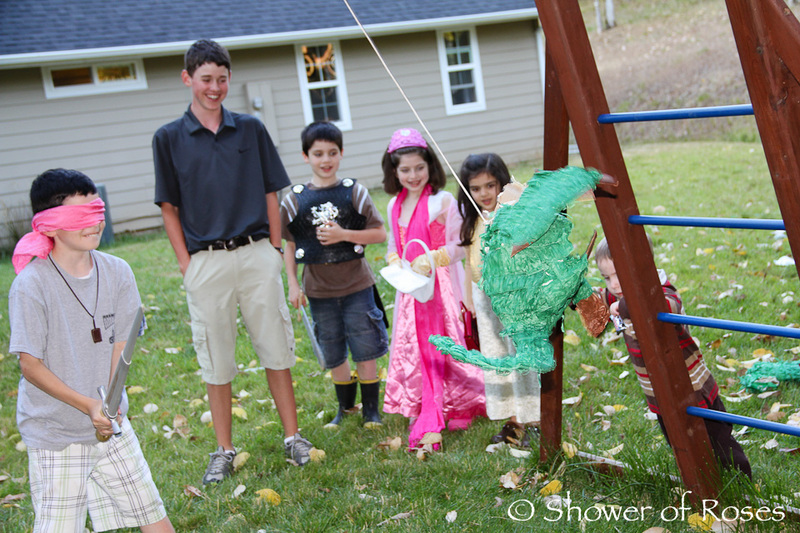 This was a special treat, and the children all had so much fun with the pinata! If you missed the short video of our little Rose trying to "Slay the Dragon," you can find it in this post. It still makes me laugh! She is so fun! After the head was chopped off, she picked it up and chased her brothers, saying "Rargh!!!!!" 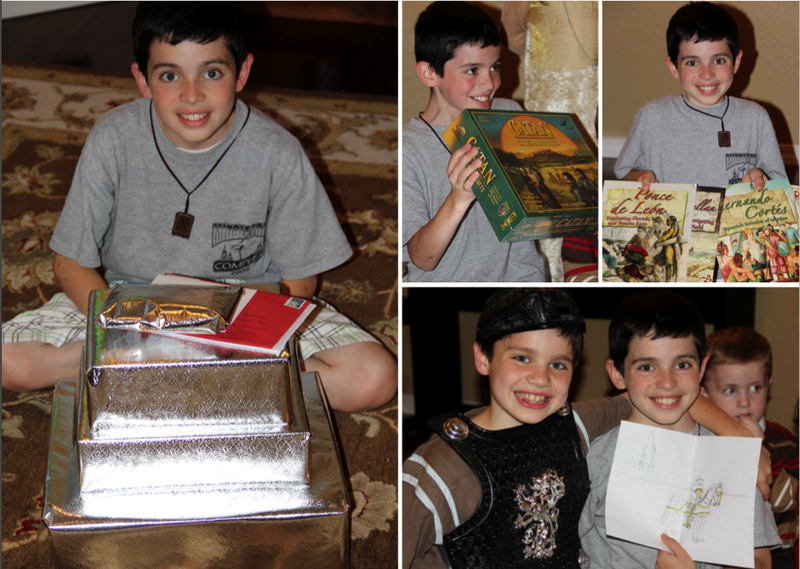 Captian's main birthday present was the Catan: Cities and Knights Game Expansion for his Settlers of Catan board game. He was so excited!! In addition, he also received some discontinued Playmobil toys (Treasure Transport and Jousting Equipment ) that I ran across at a local toy store and a few books on Explorers. (Am I the only one that uses birthdays as an excuse to purchase more school books? ;) He also received his first very own pair of Hockey Skates, picked out by his Daddy. They should come in handy this coming year, since the boys are hoping to be able to play a season of hockey. I posted a picture of Captain with his cake on his birthday, in addition to the damage attack by his impatient little brother! 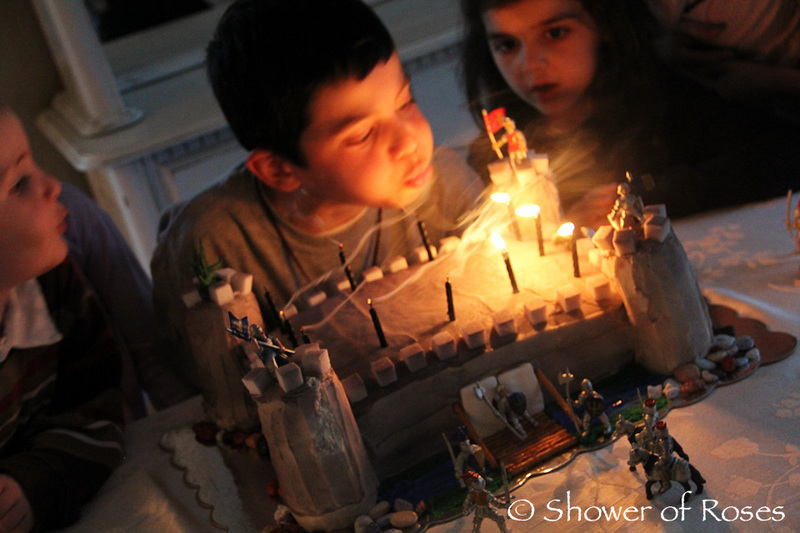 I also posted a tutorial on how to make this Knight's Castle Cake. I'm sure there won't be too many more years where Captain will want a "themed" birthday party... Despite the little bit of extra work, it is so worth the effort to make these childhood birthdays full of special memories for him. He is growing up way too quickly! 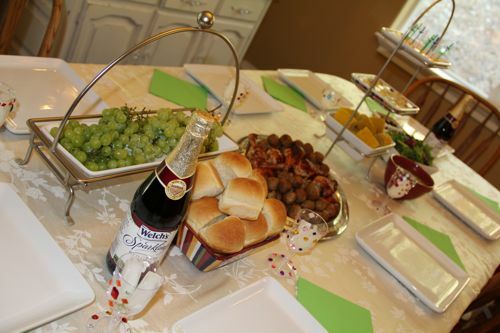 You should write a book of parties!! Happy birthday and God bless you Captain!! Your cake is wonderful!! Thanks for the tutorial. Never know when we might need it!! Fabulous as always. Looks like fun. 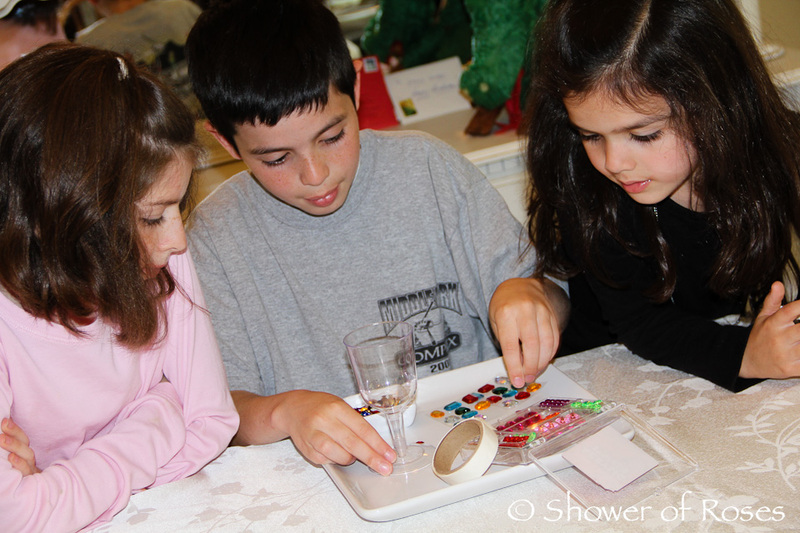 I wish I was as good as you or even your kids at making candy molds. Mine always turn out messy. i need to find some tips. You are all so sweet! Thank you!! Best birthday EVAH!!! Happy Birthday to one lucky little boy. You ought to receive the "Mother of the Year" award!!! I hope you don't mind but I am just going to have to steal some of these ideas. 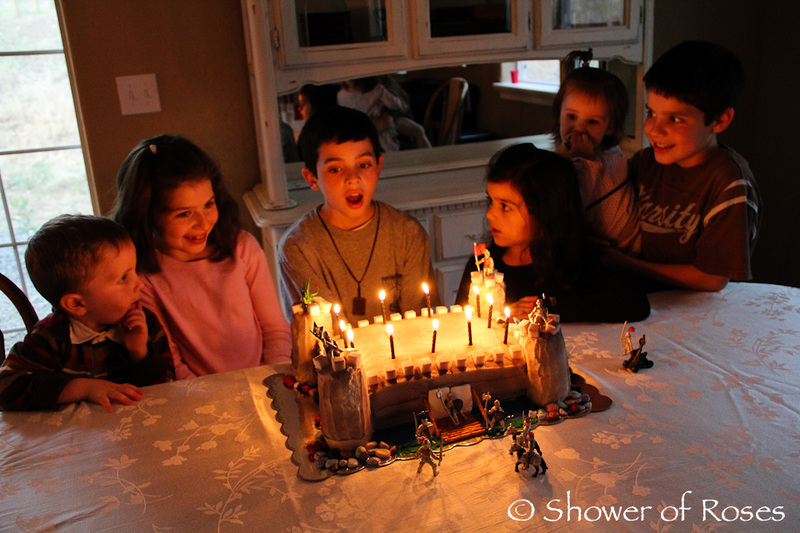 I have a lover of knights in the family and these ideas are great!! I have you ever gone to medieval times? 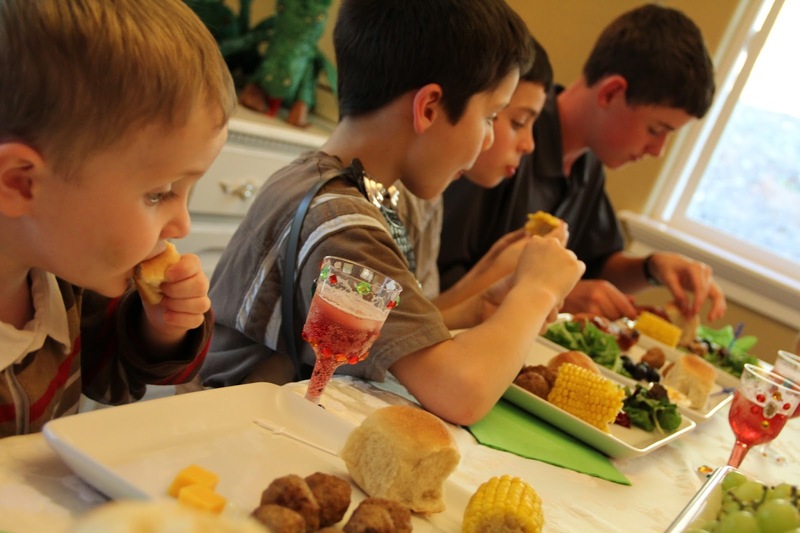 It's a dinner/show with jousting, acting and just plain fun! We went again this summer and the kids loved it! My two year old boy has become obsessed with knights after playing with his friends "armor of God" knight set. I am going to surprise him with this cake. Thank you for sharing! We used the adhesive kind, similar to these, and didn't have any trouble with them falling off.